Carlo Allegri/ReutersBlack Friday is causing havoc. 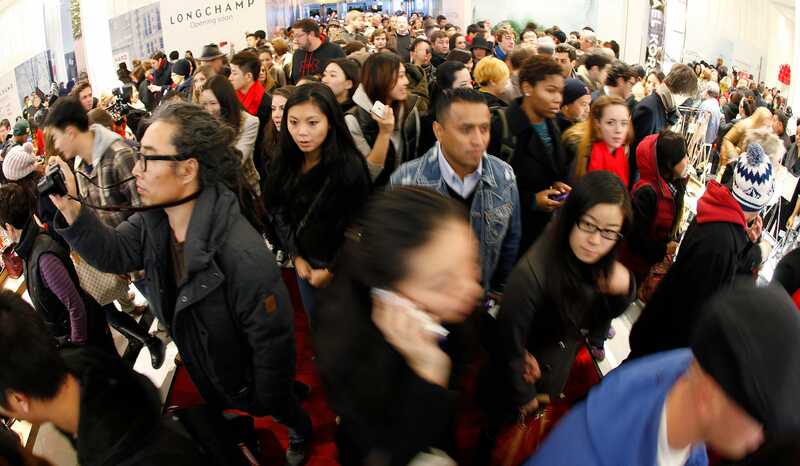 Black Friday has landed in the UK and the sales event is creating mayhem. On Friday morning, as retail outlets opened their doors at 8am, the police had already been called to more than 10 supermarkets across the country. In Manchester, officers had to make two arrests as shoppers competed to bag the best bargains. At an ASDA store in Wembley, London, images even surfaced of a shopper who had been “knocked to the ground”. And at a Tesco in Lee Valley, north London, seven police cars and two ambulances were called after scuffles broke out on Thursday night. The Guardian says the store had to close because of the commotion. The queues for Black Friday deals started in the early hours of Friday morning. Although it was first introduced by Amazon and ASDA in 2010, this year it’s proving more popular and has been taken on by more companies. The frantic buying is due to many UK retailers offering astounding deals. Sainsbury’s, which is taking part for the first time, has got massive reductions and Tesco has cut prices by up to 70%.